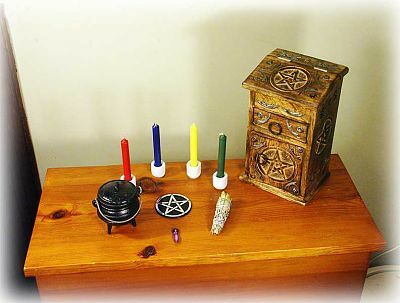 - It isn't always practical (or even advisable) to have your altar set up all the time. 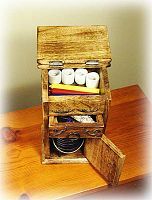 If you need something that can be packed up when not in use, use a tall pentacle chest to hold your tools. The bottom compartment is easily large enough to hold a mini cauldron, and the top compartments can hold candles, candle holders, smudge bundles and more. Do you have any other questions about our Hidden Altar? I love this ..Representing each element...The tile is very elegant! I'm not a big fan of Wicca, but this is really neat and useful. With what little space I have, a miniature alter/shrine like this works great. The ornate box is beautiful too. i like this its simple and it has the elements in the color of the candles and im sure other important stuff is packed in the box . well done i love it . its practical and it hides our sacred world if need be. Absolutely perfect for my my needs. Delightful but very useful.